'You could become the greatest living painter. Your paintings would be treasured for ever. 'Those were the words Lilias Trotter heard from John Ruskin, one of the world's most established art critics. She had to make a choice between her talent and her calling. Both were gifts from God. In May 1879 Lilias knew what she should do. God's work for Lilias was in the desert land of Algeria. Palm trees and camels replaced lampposts and horse drawn carriages. The desert was her home, its people her friends and its Creator her reason for life. 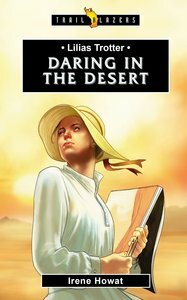 About "Lilias Trotter - Daring in the Desert (Trail Blazers Series)"